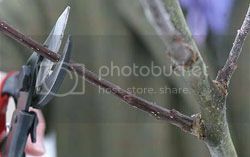 Pruning―Except for maples and birches, now is a good time to prune trees. If limbs are more than an inch in diameter, use the three-step method for removing branches. Make the first cut on the underside of the limb around 6 to 8 inches away from the trunk. Cut about half the thickness of the branch. Go to the top of the limb, and cut off the limb halfway between the underside cut and the trunk. The resulting stub should then be cut within 1/2 inch of the trunk. Lawns―Winter weeds are evident in dormant warm-season turf now. Apply spot applications of post-emergence herbicides or hand pull to control. When selecting a post-emergence herbicide such as Purge, Weed-Stop, or Weed-B-Gon, make sure you follow label directions, and that the product is approved for your particular grass type. Otherwise you may injure or kill it. Cut branches―When forsythia, quince, star magnolia, and saucer magnolia buds show a touch of color, they are easy to force into bloom indoors. Cut branches, taking care not to destroy the natural shape of the plant. They should be in full bloom several days after you place them in a vase of water indoors. This entry was posted on Saturday, February 2nd, 2013	at 3:13 am	. You can follow any responses to this entry through the RSS 2.0	feed. Both comments and pings are currently closed.